For a long time, promotoras have helped improve access to healthcare and self-management of chronic diseases. See our previous coverage of the great work done by promotoras in mental health, improving mother’s dietary intake and improving hypertension outcomes. In this week’s blog we highlight a recent article by Athena Philis-Tsimikas that examined the effectiveness of the Dulce Mothers program, a promotora intervention designed to lower diabetes and cardiovascular risk in Latinas following gestational diabetes. All women with a history of gestational diabetes mellitus have a sevenfold higher likelihood of future type 2 diabetes and also have a higher risk for developing cardiovascular disease (CVD) compared to mothers that do not have gestational diabetes. Latinas, in particular, are at higher risk for both gestational diabetes and type 2 diabetes compared to non-Latino whites. Involving peer support workers in mental health services is an effective means to improve the recovery outcomes for people living with mental illness. 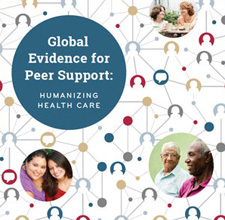 Evidence from the U.K., Australia, New Zealand and the U.S. suggests that by sharing their own experience of mental illness and supporting other patients in their own recovery journeys, peer workers can significantly improve treatment and recovery outcomes of people with psychiatric disability, and contributes to a substantial reduction in re-admission rates and bed days of mentally ill patients. In the U.S., peer worker programs should grow in importance as the Affordable Care Act comes into effect. With an additional 8 million people eligible for Medicaid, and with the requirement to include mental health service coverage in all health plans, peer worker programs may be an effective strategy to alleviate the shortage of mental health professionals.